An eighteen page chapter drawn for Volume 5 of the webcomic Afterlife Inc. The chapter can be read here. Inhibit is my longform webcomic about teenagers with superpowers. It started in January 2015 and updates every Wednesday. Inhibit can be read for free here. A print edition of the first five chapters will be kickstarted in spring 2019. For more sample pages and information, click here. 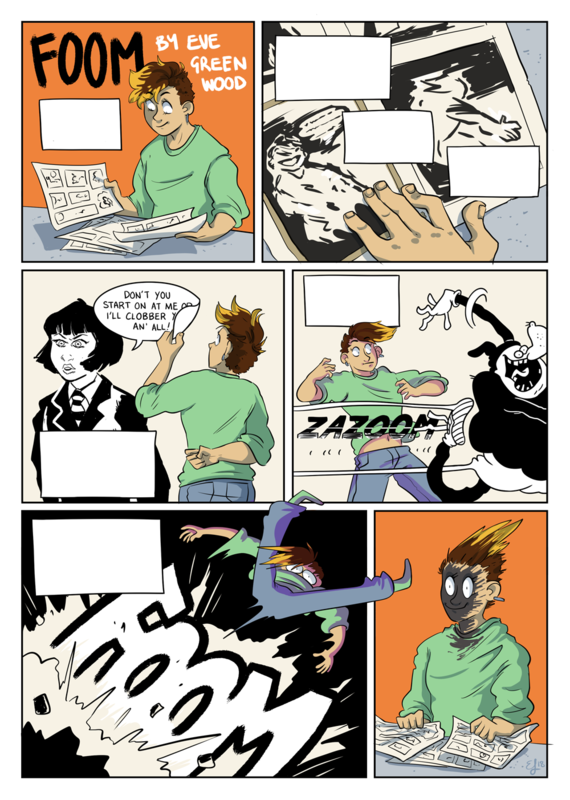 Orange Plates is a 24 page comic exploring themes of isolation and queer identity. It was produced as a dissertation project for a Comics & Graphic Novels (Design) Masters degree. Deadinburgh is a 13 page comic about a cyborg ghost-hunter in Edinburgh who gets a new partner. Print copies of Deadinburgh can be bought here and digital PDFs can be bought here. A four page comic drawn for Superhuman Futures, which explores the idea of the superhuman and the science fiction stories that influenced it. A four page comic drawn for an assignment for a Comics & Graphic Novels (Design) Masters degree. A one page comic drawn for Chronicle: the Archive & Museum Anthology (edited by Hailey Austin), featuring stories revolving around and inspired by the University of Dundee’s archive collection. Chronicle can be read here.